Can you Eat Really Well and Lose Weight? Fall has finally arrived and I couldn’t be happier. I love the fall weather the best. The days are warm and the nights cool off and pretty soon that fall smell will arrive. You know the one, it happens in the early evenings in fall. 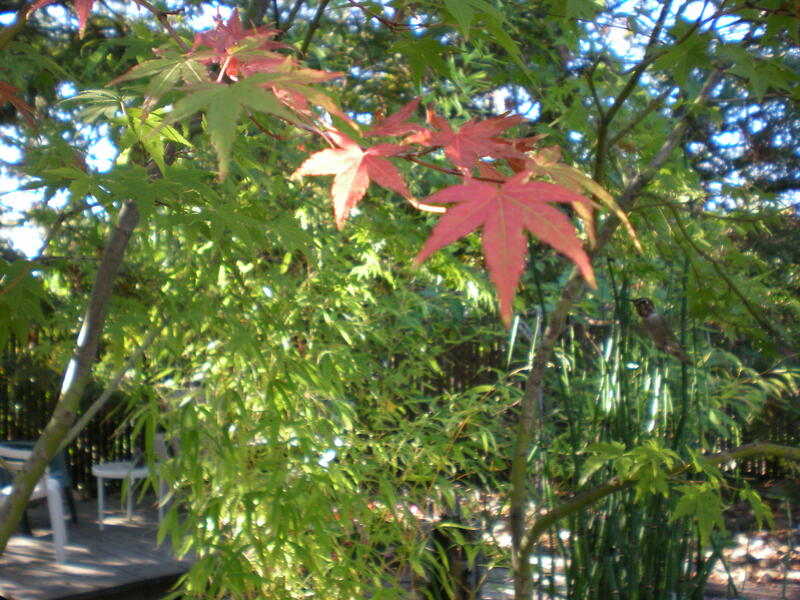 I just took this photo in my backyard just to show you the leaves are just starting to change on my Japanese Maple. Do you see the hummingbird who shot into the picture? The other thing I really like about fall is that I can cook again. I know some of you just hate to let summer go. I like summer too but only on mild summer days. When the heat arrives I have to do everything early, like work out before it gets too hot. Let’s face it mornings are only so long and unless you can really handle the heat, forget about cooking. So soon, I’ll be able to turn my oven on again and fix some great meals. And speaking of great meals, I ran across a recent blog by Dr. Mark Hyman. I love this guy. He’s a functional medicine MD and he always seems to speak to me when it comes to health. His most recent blog, The secret way Italians stay Healthy and Thin, is exactly what I experienced nearly 20 years ago. Back in 1992 I lost my job. I was feeling pretty low about it and for about three days, I sat around watching TV. Back then re-runs of Leave it to Beaver were on three times a day. As much as I love that old TV program, I couldn’t sit around anymore and watch one more episode. I knew I had to do something while I was waiting for the job market to get better. I decided to cook. My husband is the real cook in the family. He has a gift when it comes to cooking and putting meals together. I’m not sure where he learned how to cook, but I can tell you that my Mom, being half English and half Irish, didn’t have the cooking gene within her. So I bought a couple of cookbooks and started trying new things. I would pour over the cookbooks and find something that sounded good, then go shopping for dinner. I had some fear to overcome when it came to cooking at first. I knew I would never be as good as my husband. But he really encouraged me and I kept trying new things. Sure enough I was teaching myself how to cook. The most amazing thing is that I started losing weight. Cooking real foods and then sitting down to dinner with my husband to eat turned into a great event. He was less stressed because he didn’t have to come home and think of something to fix for dinner. I finally found cooking fun after all those years of avoiding it. But the amazing thing was the weight that dropped off. I wasn’t a huge person, but when I just stuck to the basics and when we ate in a more relaxed environment, the extra pounds just went away. Once I went back to work, four months later, we didn’t have the same time or energy to cook and enjoy our meals like we did when I wasn’t working. But we did try to make some changes so we didn’t fall into our old habits. I would try to prepare more things on the weekends and also to plan ahead. What about you? Are there any changes you can make to cook wholesome meals? Even little changes help. Of course this all leads back to controlling your health which in turn controls your cost when it comes to your health! We already cook from scratch at home. Avoiding the readymade foods in the supermarket has helped us to control our intake of salt and sugar. And when we are bored with our menu? I open my cookbooks, or do an online search for new recipes. Colline, I agree, ready-made foods can be kind of scary. Reading the ingredients at a grocery store will do the trick for those of us who are health conscious. Great picture of the hummingbird! I love to cook, but time is such a factor so I do prepared meals more often then I’d like. Travel is the worst when trying to eat healthy. Always end up with too much sugar and salt and fatting foods. Looking at menus in advance to spot healthy items is a good strategy for trying to keep on target. Travel can surely make it hard to make the best choices. I guess you get the hang of it after awhile especially if health is your goal.